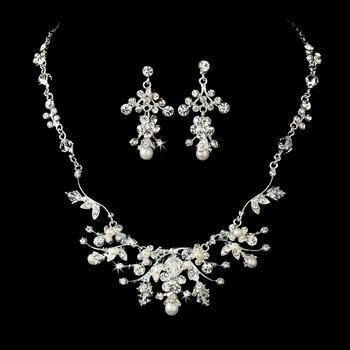 Stunning and sophisticated, this silver plated wedding necklace and earring set features ivory freshwater pearls and clear rhinestone and Swarovski crystals in a flower and vine design. This bridal jewellery set coordinates beautifully with your white or ivory wedding dress and is the perfect complement to your spring or summer wedding. The necklace measures 31 cm with a 7.5 cm extender and lobster claw clasp. The earrings measure 3.8 cm long.